We’re still in the same house, but we did shift things around quite a bit. We’ve redone some rooms, shifted some other rooms, and my husband and I moved our room to our basement. This means that my basement homeschool room has become my upstairs homeschool room. Because I got to put together a brand new homeschool room in a different part of the house. I get a library!! It also doubles as a play room. But it is a LIBRARY! It doesn’t have fancy ladders and is not Instagram-worthy, but I love it just the same. And because I enjoy nothing more than peeking at other homeschool spaces, I’m going to give you a tour of each room. And don’t forget to watch the videos at the bottom of the post. They’ll give you a video tour of both the homeschool room and the library. In our homeschool room, we still have our wonderfully large IKEA table. It’s just two table tops bolted together sitting on four banks of drawers. We love our giant workspace where we can spread out and have lots of room to work. Four of my kids have dedicated drawers in this school desk. Their drawers hold their curriculum, books, pencils, and papers. My oldest child has her own desk in another room. I have a whiteboard where I can write outlines and sentences for copywork. And it’s magnetic so I can hang up chore charts and schedules and to do lists. Our school room has my comfy chair where we curl up and read together. We have discovered that the chair can hold a maximum of four kids plus one mom. It might be a bit crowded, but we don’t care as we snuggle together and enjoy wonderful books. Next to the chair is an old nightstand that holds flashcards and other supplies for our morning time. The closet holds a large book shelf with notebooks, art supplies, manipulatives, and science books. There are also some magnetic shelves that hold extra pencils, papers, rulers, scissors, and markers. I love that I can close the door and not see the clutter of the crowded shelves. Our walls are filled with maps and places to hang art work. I think our room is cheerful and fun and I’m so happy with how it turned out. Right across the hall from our new homeschool room is our library which also doubles as the playroom. In the built-in bookcases are all of my kids’ “fun reading.” They each have several shelves for their personal books. In the shelves to the left are our literature books for each grade level. The shelf closet to the window also holds some history books. The shelf on the right houses all the history books by time period, starting with ancient history and progressing to modern day. And at the bottom are some of our favorite series like the Boxcar Children and Nancy Drew. The closet has another bookshelf that holds curriculum that we are not currently using this school year. And of course, there are Legos, a play kitchen, and toys for the baby. Often during our school day, the kids take turns playing with the two youngest girls in this room. They are nearby but not in the same room where we are trying to do school. It gives us a bit of quiet, yet I can still keep an eye on them because they are close. There you have it! That is our new homeschool space that we put together during our spring break. So, we’re getting to finish out our year while tweaking our space, and I can’t wait to start our next year with these new rooms. I’m glad the workbook was helpful! It really helps to have an organized space and have a plan for each year. 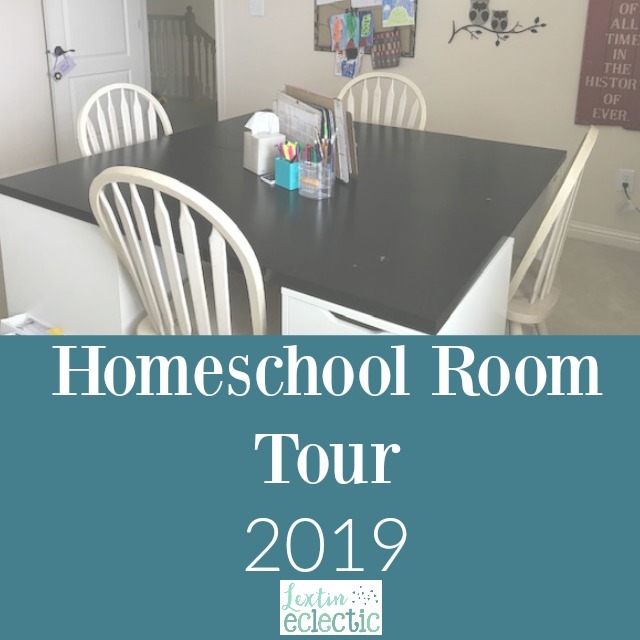 We enjoy our homeschool room but we find that homeschooling happens in every room of the house – so even with a homeschool room, it seems to spill over into everything we do. But that’s how it should be. Learning happens all through the day and in every setting.